HONOLULU — It’s Fall in Hawai‘i, and once again time to watch out for the “fallout” of young seabirds on our islands. At this time of year, native Hawaiian seabirds become disoriented by artificial lights during their maiden flights from their burrows out to sea. Hawaiian seabirds have an important role to play on our islands. They were traditionally used by navigators to find their way back home to their islands; they help our fishermen to locate schools of ahi; and are critical to our watersheds by helping to fertilize the soils with marine nutrients in their droppings. Each year people pitch in to help these birds by turning their lights down and rescuing birds when they are found. Hawai‘i’s small land area and increasing human development have left many of our native birds in a tough situation. Seabirds in particular have run into trouble when chicks take their first flight out to sea. As they rely on the light of the moon to guide them out to sea, they may be attracted to, and disoriented by onshore sources of man-made light. Individual young birds will circle these lights until they eventually fall to the ground from exhaustion, or from colliding with buildings or vegetation. This occurrence is often referred to as “fallout” and it occurs primarily between September and December each year. When grounded, these birds are at risk of predation by cats, mongoose and other predators, vehicle collisions, and starvation. Fallout birds are often seen landing or sitting on roadways, parking lots, and lawns. 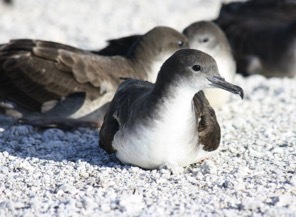 The public is asked to be on the watch for young seabirds especially the threatened and endangered species such as Newell’s shearwaters (A‘o) and Hawaiian petrels (Ua‘u), as well as the more common Wedge-tailed shearwater (Ua‘u kani). Wedge-tailed shearwater chicks that are found outside burrows on coastal trails and beaches should be left in place unless there is imminent danger of harm due to dogs, cats or some other activity. These chicks, prior to their first flight, will normally sit outside their burrows exercising and imprinting on their natal area before leaving the nest. It is important that the public realize that these birds are not lost, abandoned, or injured. If you have questions about a Wedge-tailed shearwater, please call the DOFAW Office. Often young birds stay near their nest burrows and do not need intervention. These birds will not need to be rescued and should be left alone. If you are uncertain of whether the bird needs help, please call the Division of Forestry and Wildlife or Hawaii Wildlife Center for assistance. if a bird is found unresponsive or in an unsecure environment (i.e. side of the road, next to a building, etc. ), it needs to be rescued. With caution, approach bird from behind and use a lightweight towel to gently pick it up and transport it to the carrier. DO NOT give food or water to the bird and do not leave any in the container. Note the time and location of where you found the bird. Transport the bird to a designated drop off location if available, licensed wildlife rehabilitation facility or any veterinary clinic as soon as possible. See island-specific contact information and licensed rehabbers http://dlnr.hawaii.gov/wildlife/downed-wildlife-contact-details/. Birds can be held overnight if transportation to a drop off location is not immediately available. Keep the carrier inside or in an enclosed garage away from people and animals until it can be transported. For more information, please visit our website: http://dlnr.hawaii.gov/wildlife/seabird-fallout-season/.